ABOVE: Indonesian masks from a "Masks of Asia" exhibition at the Museu do Oriente, Lisbon. INSET BELOW: A model of Goa Cathedral. 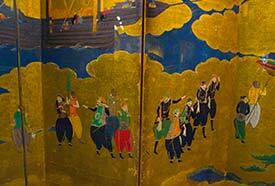 In English, the name of Lisbon's Museu do Oriente means Oriental Museum or Museum of the Far East. Don't let the name deter you: This new museum, which opened in 2008, isn't your grandfather's static gallery of Chinese vases and Japanese paintings. Instead, it's a visually stunning and superbly presented view of Asian art and culture from a Portuguese perspective, drawing on Portugal's history of exploration, trade, Christian prosyletism, and cultural interaction in Asia from the 15th Century through modern times. Portuguese Presence in Asia begins with exhibits from Macau (a Chinese territory once administered by Portugal), where you can view scale models, statues, Chinese folding screens, and other displays which--among other things--show Portugal's role in the "China Trade." As you move through the exhibits on the first floor, you'll also see displays from Goa, China, Japan, East Timor, and other Portuguese outposts or trading areas from the 1500-1900s. 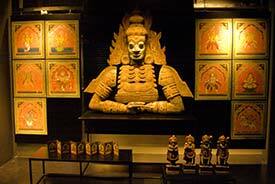 Gods of Asia explores religion and mythology through costumes, puppets, masks, statues, paintings, games, and other items from the Kwok On collection of more than 13,000 objects. 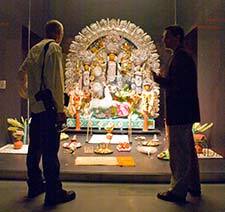 ABOVE: Visitors admire a display in the "Gods of Asia" permanent exhibition. The Museu do Oriente occupies a former Port of Lisbon warehouse that dates back to 1939. The six-story concrete structure was built to store bacalhau, or dried cod; nearly 70 years later, architects João Luís Carrilho da Graça and Rui Francisco renovated the building, cleverly turning its interior columns into frames for display cases and adding such features as an auditorium, a restaurant, a cafeteria, and a shop. For visitor information--including hours, prices, and how to reach the museum--see the Museu do Oriente Web site. Portugal began trading with Japan soon after its explorers arrived in 1543. (See Wikipedia's Nanban trade article.) 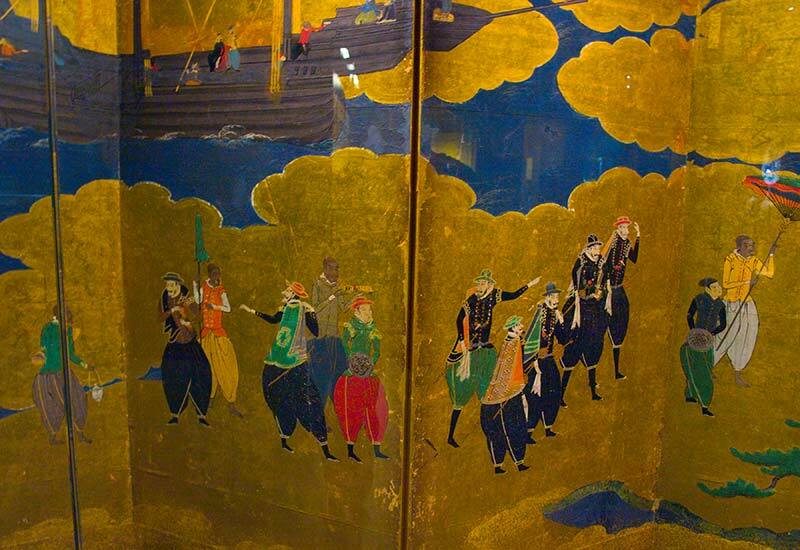 This gilded screen at the Museu do Oriente portrays a ship, Portuguese traders, and Japanese dignitaries. You can view a larger, 800-pixel-wide version of this image (79K) by clicking here. In Japan and China, Christian symbols took on a local flavor during the Portuguese missionary era. 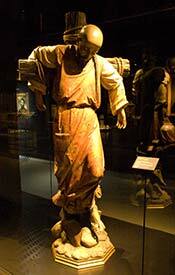 These wooden sculptures from Southern India are in the Museu do Oriente's permanent "Gods of Asia" exhibition. 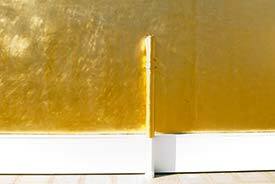 The terrace outside the Museu do Oriente's top-floor restaurant has an eye-catching feature: a long section of building wall covered in gold leaf.